This piece is from Basil Kincaid's "Reclamation 2," showing at The Luminary through Feb. 27. Visitors to The Luminary on Cherokee Street examine Basil Kincaid's work. Detail from a piece in Basil Kincaid's "Reclamation 2"
It's no stretch to think that Basil Kincaid’s efforts to unite people of African heritage require travel. But pre-paid phone cards, vinyl sheets and a strong adhesive are also part of the process. Kincaid recently returned from the West African country of Ghana, where he used donated phone cards and other found materials in a village-wide art project. Now the results of that undertaking have come full circle, back to St. Louis, for an exhibition at The Luminary arts incubator, 2701 Cherokee St. In our latest Cut & Paste podcast, we talk with Kincaid about the country he fell in love with and the project that joins two worlds together and promises to connect others. Willis Ryder Arnold and Nancy Fowler talk with Basil Kincaid about the inspiration and peace he found in Ghana. Making art involves creativity, of course. But for many artists, including St. Louis’ Tate Foley, exactitude is every bit as important. Printmaker Foley is meticulous about following the necessary steps, in strict order. One of his first steps sometimes involves ordering from eBay, since Foley’s work explores consumerism using things like gum wrappers and trading cards. The arts in St. Louis are similar to the fabled elephant described by six men who cannot see: “It’s like a snake!” cried one who grasped the tail. “No, a tree trunk!” insisted another, as he rubbed a leg. Art is a staged dialogue that makes you wince with recognition. It's a brushstroke that evokes sadness; a beat your toes can’t help but keep. And it's as unique as the artist, as we've learned in our first year of putting together the Cut & Paste podcast. For multimedia artist Lyndon Barrois Jr., the different genres came together like a stack of building blocks. As a child, he liked to draw, but he didn’t paint until his third year of college. Then in grad school, he began to embrace sculpture and other creative means. Soon he was making art with the idea that every work should take whatever form suits it best. 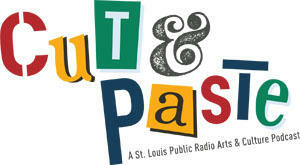 ‘Cut & Paste’ podcast: Who should tell the stories of African Americans in St. Louis? A new $5 million donation will help the Missouri History Museum collect and exhibit St. Louis’ African-American history. But not everyone trusts a large, mainstream institution to tell these stories. While the History Museum thrives through such contributions and with Zoo-Museum District funding, the Griot Museum of Black History struggles to even pay its utility bills. In the weeks ahead, we’ll have a detailed report of this languishing establishment.